07 | November | 2014 | Troy C. Wagstaff aka CallahanWriter Blog: Topics of interest include Western Historical (1865-1899) Topics. Additionally inspirational Christian and Fibromyalgia interests. It is no secret to any Christian that Jesus taught frequently in Parables. He used the Parable style of teaching so that those who heard Him teach, but were not ready to receive the message, wouldn’t be condemned. He taught in Parables so that those who had eyes to see, ears to hear, and hearts to know and feel the message, could by taught important saving principles The Savior had to offer. Parables are a symbolic way to teach. Like a metaphor, the symbols give us something to compare the teachings with which can greatly aid our understanding. With Parables you can learn lessons beyond what a superficial reading can teach you. In that vein, we will look at the Parable of The Prodigal Son. The primary message is about repentance, mercy and forgiveness. Luke 15 begins with begins with the Parable of The Lost Sheep which is followed by the Parable of The Lost Piece of Silver. The Parable of The Prodigal Son brings up the rear with a little more detail about forgiveness than what is found in the first two Parables. The clear lesson to the first two Parables is the joy that the Father has when we repent and He forgives us. The recurring theme in Luke 15 is about sinners that were lost, then repented and were found through repentance by The Lord. Luke 15 teaches us also about the very great joy that our Savior and our Father in Heaven have when we repent and are found again. To drive the point home, the Master Teacher uses The Parable of The Prodigal Son (Luke 15:11-32). 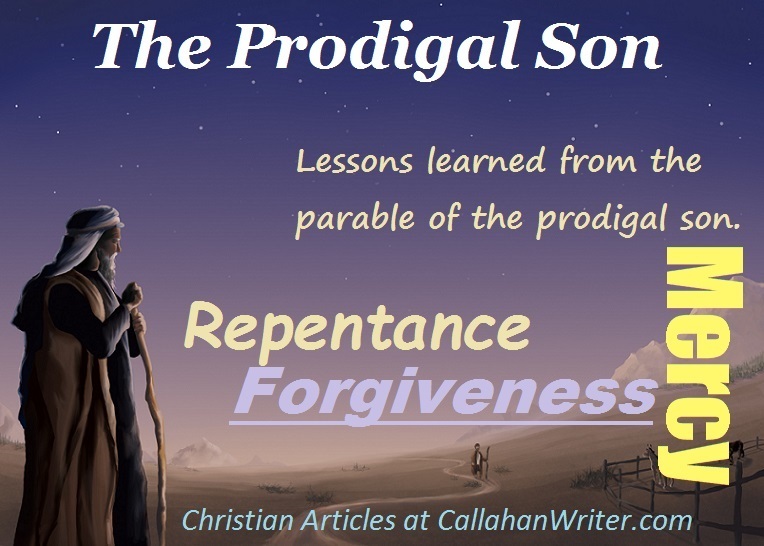 The lesson of repentance and forgiveness through God’s mercy is illustrated in this Parable, but there is more to learn from that Parable. The great Parable tells of a man with two sons. One son was faithful and stayed with his father. The other son asked for and received his portion of his inheritance. He left his father and brother and went off to a far country and spent his inheritance over many years of riotous living with harlots. After the prodigal son had exhausted his resources, there arose a famine in the land and he had nothing to live on. He went to work for a farmer and was given the job to feed swine. All that the prodigal son had to eat were the husks that were fed to the swine. This indicates the prodigal son was as low as he could get. After a while he “came to himself” realizing that even his father’s servants had more than enough bread to eat. The thought occurred to him that he could return to his father and be a servant and have plenty to eat in return for his labor. He realized that he was no more worthy to be called his father’s son. He knew he had sinned greatly both before his father and against Heaven. He journeyed back to his father’s house. While he was yet along way off his father saw him returning. The father of the prodigal son had compassion upon his returning son. The loving Father ran to met his son and wrapped him up in his loving arms and kissed him. The loving father of the prodigal son instructed his servants to clothe him in the best robe and put shoes on his feet and a ring on his finger. Lessons learned from this Parable are emphasized in the preceding two Parables. The Lord our God rejoices in the sinner that humbly repents and seeks forgiveness. The father of the prodigal son celebrates the return of his lost son, restoring him with clothing and food in a joyous celebration. The sinner who humbles himself and repents will be forgiven. Our Lord and Savior is anxious to forgive and does so through His tender mercies. Along with His angels, He celebrates in the return of the lost sinner. It is deeply moving that not only does the Lord want to forgive but also celebrates and finds great joy in forgiving the humble sinner. These Parables, especially the Parable of the Prodigal Son teaches us of humility, sorrow for sin, repentance, mercy, forgiveness and the joy that Heavenly Father and His Son, Jesus Christ has in forgiving us and bringing us back into the fold. There are more lessons to be learned from the Parable of the Prodigal Son that highlight other important concepts than the Lost Sheep and the Lost Piece of Silver. The father had two sons. We have discussed the prodigal son but there is another son who at the beginning of the Parable was the righteous son. He stayed with the father (keeping the commandments) while the prodigal went off in living. The faithful son refused to join in the celebration. After a while, noticing that his other son was not in attendance, the father went after the “righteous” son. After finding the faithful son the Father asked him what was troubling him? From a natural man standpoint one can see his point. He was faithful and the sinner comes back after “sowing wild oats” and gets a big celebration. Perhaps we should make sure to rejoice in the good living of the faithful. In a sense, this Parable of the Prodigal son is a story of two prodigal sons. The second faithful son showed signs of not wanting to forgive. He showed a symptom of pride. But the good father taught him of the importance of finding the lost sheep and having joy in finding the lost sheep. The Prodigal Son tells of a son who was rebellious and goes on to live a sinful life. Thankfully the son came to realize his sin and was humbled and sought forgiveness at his fathers hand. The first two Parables talk of the joy of finding a lost sinner. The Prodigal Son takes it a step further and talks of a rebellious sinner. The Prodigal Son knew what he had and chose to take his inheritance and go after a worldly life of sin, lust, greed and riotous living. A sinner who has lived a life of sin and becomes humble and desires to repent needs to be saved from his sins through the mercies of the atonement of Jesus Christ. A rebellious sinner is a little more grave because they sinned against a greater light. Nevertheless, they can be, like the Prodigal Son, forgiven. The Lord rejoices in his repentance just like any other sinner. We, like the faithful son, need to be willing to forgive the “sinner” just like our Savior is willing to forgive. That may not be as simple as it seems on the surface. After all, we are humans living in a world ripening in iniquity. Pressure abounds everywhere. Just trying to withstand the temptations we are faced with is a challenge. The Prodigal Son speaks of Gods mercy and joy in forgiving his lost sheep. It also speaks to us to forgive others their trespasses against us. Troy Wagstaff © Copyright. All rights reserved.